It’s long been a mystery why the enduringly popular Boss HM-2 Heavy Metal pedal has been out of production for quite so long - being as it at the root of the key Swedish Death Metal genre/movement, and still the weapon of choice for many of the best practitioners of that art. A pristine HM-2 on Reverb.com is becoming increasingly rare, and when it does appear its pricing is often quite frankly ridiculous. Super Tone Shaper Guillem Vilademunt of Decibelics / Golden Horse fame has been hard at work for many months to perfect a proper professional studio-grade recreation of the HM-2, but in mini format. This of course provides many more challenges to the task at hand as the afforded real estate can only accommodate so many components - which Guillem still wires / mounts by hand. He has mostly been working with Metal maestro Jordi Creus on perfecting the circuit to produce as accurate a reproduction of the HM-2 from the very best components and materials currently available. Guillem could have approached the pedal in several different ways - doing his own take on the HM-2, or aligning the Full-on voicing with all dials at 12 o’clock. But after much consultation it became clear that what the Metal / HM-2 fans really wanted was an as exact a recreation as was possible - including the optimal setting with all the dials fully cranked / dimed. I personally would have gone for the 12 o’clock thing, but then I am not really the typical profile of customer for this pedal. Those customers want a reasonably priced clone with pretty much everything the same as the original. In fact - and apart from the miniaturisation, Guillem has gone a couple of steps better - in managing to significantly improve the noise floor of the pedal, and at the same time he is providing True ByPass. I’ve been associated with Guillem since about mid-way through his Golden Horse pedal campaign when I discovered and bought one - which of course I really love, and which has been my main Klone pedal ever since I got it - there are a number of features on this site about the Golden Horse - which is really pitched as more of a Deluxe version pedal - in that mini format - I would like to say ’The World’s Finest Mini Pedals’! For the Angry Swede - the proposition is slightly different - we don’t want an unnecessarily pricey deluxe pedal - what we needed here was a proper professional journeyman pedal - of a high enough quality and durablility to withstand the rigours of hard touring. So the Angry Swede is a fully professional / studio-grade pedal built to the highest specifications yet within a mini 1590A style enclosure. I was very fortunate to be included in the small circle of Beta Testers for this pedal, and I've been testing it in my rig since it arrived on Monday. Before it arrived, my key concern was not really the sound or tone profile - as I know Guillem's ear as such, and know that he would run frequency analyzers and do blind tests against the circuit until it sounded indistinguishable from the original - just as he did with the Golden Horse. My concern was chiefly for the volume actually. When you have really just one key setting on your pedal - i.e. with all dials on max, you need to be very sure that everything is just right, and I've had problems in the past with Mini pedals not being loud enough. In fact several Mini pedals you need to run at 18V to get the volume you need. For the HM-2 style circuit, there are so many components needed for that richly textured tone - as you can see in the above image - that there really is no space for voltage doubling or further internal trimmers or switches unless you use modern SMT components- which is not what Guillem is about. In short, the circuit has to be pretty much perfect on that one classic dial setting. And I'm mightily proud to reveal that the pedal passes the Goldilocks test - hitting that perfect combination of distortion and volume with all the dials maxed out. I'm still at heart a pedal-tweaker and part of me always wants extra clipping options and variations for more versatility. But those things just aren't possible here, nor are they part of the proposition as they would undoubtedly add costs, and are unwanted by the majority of the customers for this pedal. So the proposition really is - you want a pristine HM-2 with all the key characteristics of that circuit intact, but in a smaller higher quality pedal format - still at a reasonable price. Meaning that this should be absolutely perfect for all those Death Metal fans - who can now collectively breathe a sigh of relief that they no longer need to scramble for pristine examples of HM-2's on Reverb.com - they just need to get on the waiting list for the Angry Swede! Lead Guitarist of Death Metal band Nightbearer - Dominik Hellmuth provides some useful tones and sound comparisons between the Angry Swede and its original inspiration. Testing and prototyping is still ongoing, but I believe the pedal is around 99% of the way to its final format. The prototype versions have decals instead of screen-printing, and some final tweaks are to be expected. In terms of overall component selection and final make-up I believe the pedal is now complete and pretty much near enough ready for a proper production run. I will of course provide more details as Guillem releases them - As far as I am concerned at least it is Mission Accomplished! 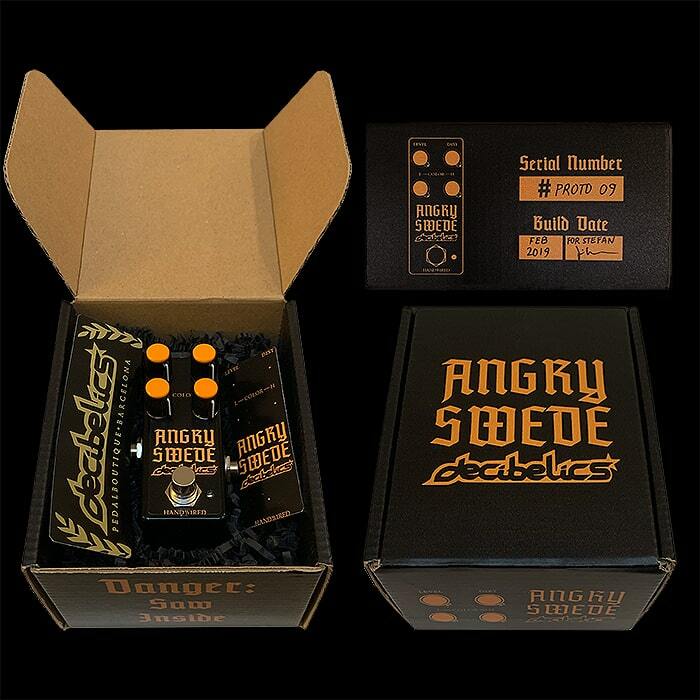 Further details on the Angry Swede [Here] including Pre-orders.